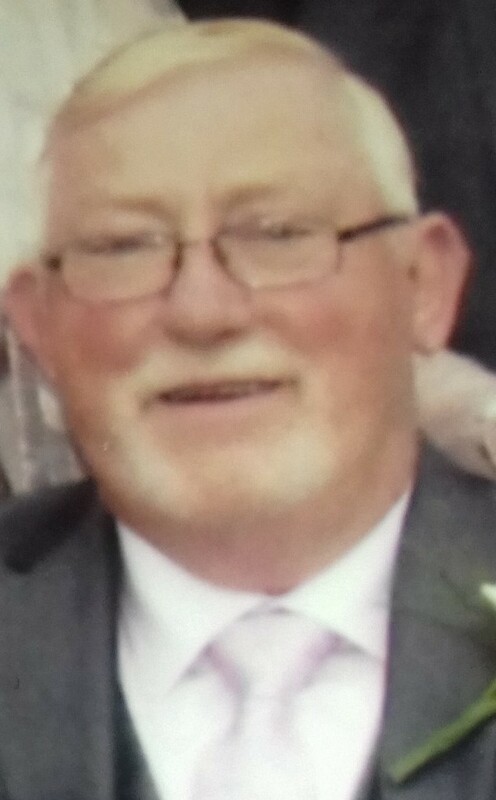 POWER Liam (Bill) (Lakeside Park, Newbridge, Co. Kildare) -11th February 2019 (peacefully) in the loving care of the staff of St. Brigid’s Hospice, The Curragh. Sadly missed by his loving wife Audrey, daughters Samantha and Geraldine, son Daniel, extended family, relatives and friends. Reposing at his residence on Tuesday from 5 o'clock until 8 o’ clock, with prayers at 7 o'clock. Removal by Anderson & Leahy Funeral Directors on Wednesday morning at 10am to arrive at St. Conleth’s Parish Church, for Mass at 11am. Burial afterwards to St. Conleth’s Cemetery, Newbridge. Family flowers only please. Donations, if desired, to Friends of St. Brigid’s Hospice, The Curragh. Donations box in the Church. Deeply regretted by his loving wife, family , relatives and friends. Reposing at Rigney's Funeral Home, Athy from 7pm on Wednesday evening with Rosary at 8pm. Removal at 10.30am on Thursday morning to arrive at St. Michael's Parish Church, Athy for Requiem Mass at 11am. Burial afterwards in St. Michael's New Cemetery, Athy. and late of Stacks Mountain, Listowel, Co Kerry. Died peacefully in the loving care of the staff at Our Lady of Lourdes Care Facility, Kilcummin, Killarney. Beloved aunt of David, Simon, Brendan, John, Michael and Declan Fuller. Predeceased by her parents Simon and Mary Lynch, her sister Eileen (Fuller), her brother Timmy Lynch, brother-in-law Dr Patrick Fuller and sister-in-law Margaret Lynch. Sadly missed by her nephews and their families, her extended family in North Kerry, her many neighbours and friends in Kilcullen and the community of Our Lady Of Lourdes Care Facility, Killarney. "May She Rest In Peace"
Rosary will take place in O'Shea's Funeral Home, Cathedral Place, Killarney on Wednesday evening at 8.00 pm, 13th February 2019, all welcome. Funeral will take place in Kilcullen, Co Kildare, details to be confirmed. Flynn (nee Kenny), Ballygar, Co. Galway, February 9th, 2019, peacefully at the Galway Clinic, Phyllis, predeceased by her brother Billy. Much loved wife of the late Seamie and dearly loved mother of Sharon. Sadly missed by her loving daughter, son in law John Joe, grandchildren Lorraine, Linda and Alan, great grandchildren, brothers Paddy and Christy, sisters May, Lilly and Nancy, relatives, neighbours and friends. Reposing at her residence on Monday evening from 5 o’clock until 8 o’clock. Removal on Tuesday morning to St. Mary’s Church, Ballygar, for Funeral Mass at 12 o’clock, with burial afterwards in the adjoining cemetery. Family time at her residence on Tuesday morning please. Peacefully, in the tender care of the staff of Willowbrook Nursing Home, Newbridge. Beloved wife of the late Joseph (Joe). Sadly missed by her loving sons Gerard and Martin, daughters-in-law Jackie and Deirdre, grandchildren Zoe, Ciara, David, Jack and Daragh, sisters-in-law Kathleen and Ann, relatives and friends. Reposing at The George Mullins Funeral Home, Kilcullen Road, Naas, on Monday from 5.30pm with prayers at 7pm. Removal on Tuesday morning at 9.30am arriving at the Church of St. Brigid, Kill, for Funeral Mass at 10am followed by burial in St. Corban’s Cemetery, Naas.